“These important recommendations from Professor Mike Horrocks could not only save the lives of 100 patients a year, but get vascular patients quicker test results, shorter waiting times and better recoveries, all while saving the NHS £16 million. The NHS could save more lives by enabling more patients to receive urgent surgery sooner if a fully-fledged vascular networks model was adopted across the NHS in England. According to the latest report from the Getting It Right First Time (GIRFT) programme, this would help to reduce the likelihood of life-threatening strokes, TIAs (transient ischaemic attacks), aortic aneurysm ruptures and arterial blockages. The recommendation for networks has been welcomed by The Vascular Society and the Royal College of Surgeons. Seventy NHS trusts in England conduct vascular surgery and many of these collaborate within a local network. However, there is no standard model across the NHS for networks and there is large variation in size, staffing and throughput. Analysis by GIRFT has found that the adoption of a fully-fledged nationwide, 7/7 vascular surgery ‘hub and spoke’ network of specialist units treating every vascular surgery case as ‘urgent’ could save 100 more lives, substantially reducing the risks associated with blocked arteries such as sudden death, strokes, restricted movement, and amputations. The creation of central specialist vascular surgery hubs would ensure round-the-clock availability of the early diagnostics, decision-making expertise and intervention so often critical to the successful treatment of vascular conditions. Professor Mike Horrocks, author of the GIRFT national report into vascular surgery in England, identified a total of 17 recommendations aimed at improving efficiency, better patient outcomes, and reducing unwarranted differences between hospitals. Professor Horrocks explained: “By looking at the trusts’ own data and by holding frank discussions with clinicians and managers it became clear that the current surgical service is not configured to meet the clinical needs of vascular patients. In-depth analysis of the unwarranted variation in trust data, allowed us to identify how best to structure the vascular surgery field for patient requirements and to make trusts more efficient. The recommendations promise to make vascular surgery less debilitating and easier to recover from and, most importantly, an opportunity to prevent over 100 deaths by reducing mortality rates for some vascular procedures. The recommendations, which have been fully endorsed by the Vascular Society of Great Britain and Ireland, will be delivered by GIRFT’s implementation teams, working with NHS Improvement and alongside bodies such as NHS England, and the Royal College of Surgeons, as well as directly with trusts, Clinical Commissioning Groups and Sustainability and Transformation Partnerships. Miss Susan Hill, a Consultant Vascular Surgeon and Vice President of the Royal College of Surgeons, said: “Vascular surgery involves complicated and high risk procedures performed by both surgeons and interventional radiologists. Patients with arterial disease can be at risk from sudden death due to ruptured aortic aneurysm, death or disablement due to major stroke and limb loss secondary to occlusive arterial disease (caused by blocked arteries in the legs), or complications of diabetes. “The GIRFT Vascular report shows that many patients with potentially fatal conditions can wait far too long before they see a consultant vascular surgeon. It also demonstrates great variation in provision of care across the country which does not need to be the case. GIRFT recommendations include the reconfiguration of vascular services into networks with high volume regional central units, a model the Vascular Society has recommended for many years. This would improve access to specialists, improve outcomes, and reduce costs. Professor Mike Horrocks was formerly Professor of Surgery in Bath before his recent retirement and has been Secretary General of the European Society of Vascular Surgery and President of the Vascular Society of Great Britain and Ireland, President of the Association of Surgeons of Great Britain and Ireland (ASGBI) and a Council member of the Royal College of Surgeons, chairing Education and Professional Standards and elected senior vice-president. The NHS delivers around 43,000 vascular surgery procedures every year. While it also covers numerous procedures undertaken on veins and the lymphatic system, the vast majority of vascular surgery involves the arteries, improving blood supply to organs and areas of the body. Examples include surgery to prevent rupture of abdominal aortic aneurysms, unblocking or bypassing arteries that are blocked by atherosclerosis (hardening or furring of arteries), and reconstructing damaged arteries. The GIRFT programme works with frontline clinicians to help improve the quality of care within the NHS by identifying and reducing unwarranted variations in service and practice. It is a partnership between the NHS Royal National Orthopaedic Hospital Trust (RNOH) and NHS Improvement (NHSI). 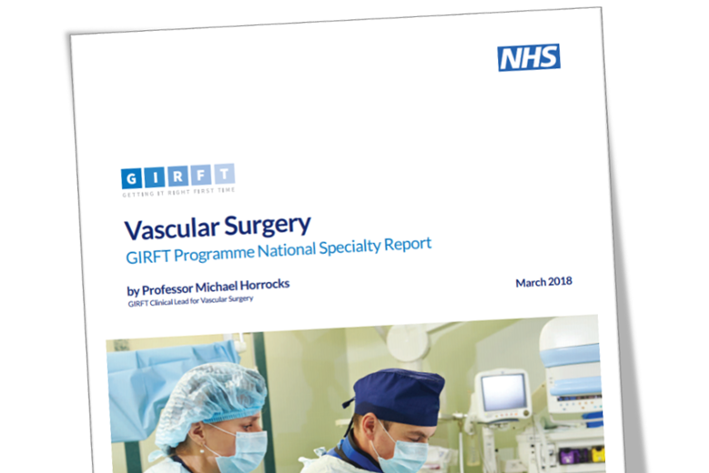 The GIRFT Vascular Surgery Report is the second since the programme’s methodology was rolled out to cover 35 specialities, following an initial orthopaedic surgery pilot which published in 2015. The GIRFT national report on General Surgery was published in August 2017. The GIRFT methodology analyses hospital data looking for unwarranted variations; differences between trusts in areas such as effective procedures, length of stay, infection rates and costs. GIRFT then recommends changes to reduce variations and improve the effectiveness of care. The recommendations in the GIRFT national Vascular Report offer opportunities to make savings or improve productivity. The report identifies a gross notional financial opportunity of between £7.6m and £16m, with a further £6.5m savings opportunity in procurement.